Us Android nerds love acronyms. And one that we throw around an awful lot is "RSS." Let's take a look at what it is, and how (and why) you should use it. After the break, people. In a nutshell, RSS -- which stands for Really Simple Syndication -- is a way for us, the website, to push information to you, the reader, without you having to come and get it. And it's a pretty handy service. The universal RSS symbol is that orange guy you see up top here. (Minus the headphones.) When you see it, either on a web page or somewhere on your browser, it means that there's an RSS feed about, and it's waiting to be subscribed to. Above is what you see when you click on the Android Central RSS link. (Erm, it's what you see if you don't have a default RSS reader set up yet.) You can see several options for RSS readers on the right, including Yahoo, newsgator, Google, netvibes, etc. Or you can subscribe with any reader you want. Me? I use the web-based Google reader. Which looks like this. This is Google Reader. From it, I have access to the hundreds of feeds I follow, bringing thousands of stories to me every day, updated constantly. The news comes to me. I don't have to go searching for it. Sometimes you'll see an RSS feed link end in "xml." That's completely normal, so don't freak out. And that brings us to your RSS on your Android phone. The two main ways you'll be likely to use RSS are for news, and podcasts. 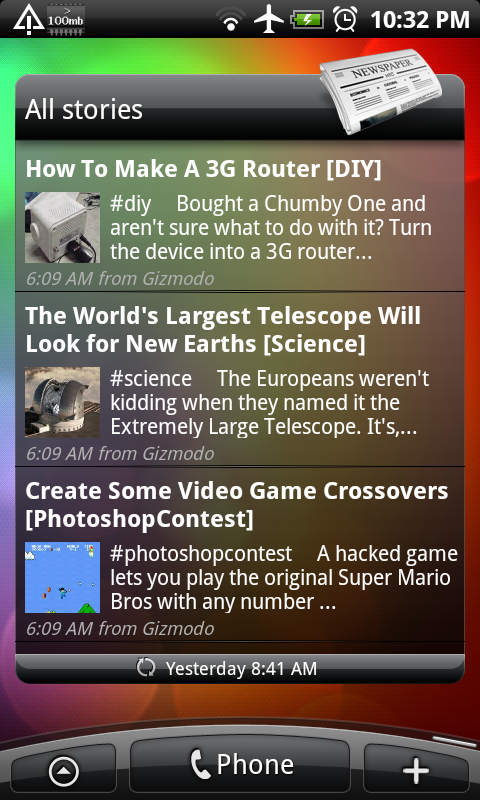 Above are but two ways to use RSS news feeds on your Android phone. On the left an RSS news widget in the new Sense UI. On the right is the Google Reader mobile version. Some RSS readers sync with your Google Reader feeds. Some require you to add the feeds manually. We'll have an RSS reader roundup in the near future. RSS feeds also are how you subscribe to podcasts on your phone, using what's called a "podcatcher." Really, it's just another RSS reader, tailored for podcasts. (See our podcatcher roundup for some of your favorite apps for that.) Most podcatchers (the good ones, anyway) have categories of podcasts to choose from, or allow you to search for specific shows. Google's "Listen" podcatcher goes one further and allows you to subscribe to podcasts via Google Reader. The podcast RSS feed is then synced to Google Listen on your phone. Another way to add podcast feeds on your phone's podcatcher is to directly add the RSS feed. Attention Google Listen users: That's what you have to do to add our podcast feed, as for some reason Google still hasn't indexed it. You either need to sync it from the Google Reader side, or manually add http://feeds2.feedburner.com/androidcentral?format=xml. And that's it. Adding a podcast to a podcatcher -- or any RSS feed to a reader -- is as simple as adding the RSS link. Easy. As. Pie. Now get to subscribing!